A migrant has been killed on the Eurotunnel tracks trying to make it to the UK. The man is the 13th migrant to die trying to get to Britain since late June, and the fourth in 10 days. The man's nationality is not confirmed, although the BBC has been told by people in the migrant camps in Calais he was Eritrean. 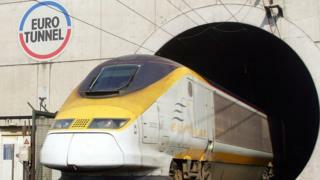 A spokesman for Eurotunnel said a man was found unconscious beside the tracks at 01:00 BST on the French side. A train driver was receiving "psychological support", he added. "This is another very regrettable incident and shows how dangerous it is to try and cross the tunnel illegally," he said. On Tuesday it was reported that a 20-year-old Iraqi man had been found dead in a UK-bound lorry. Last week, a teenager, thought to be from east Africa, was killed by a freight train near the Channel Tunnel entrance in Calais. The situation in Calais is part of a wider migrant crisis across Europe, with huge numbers of people heading north from the Mediterranean.